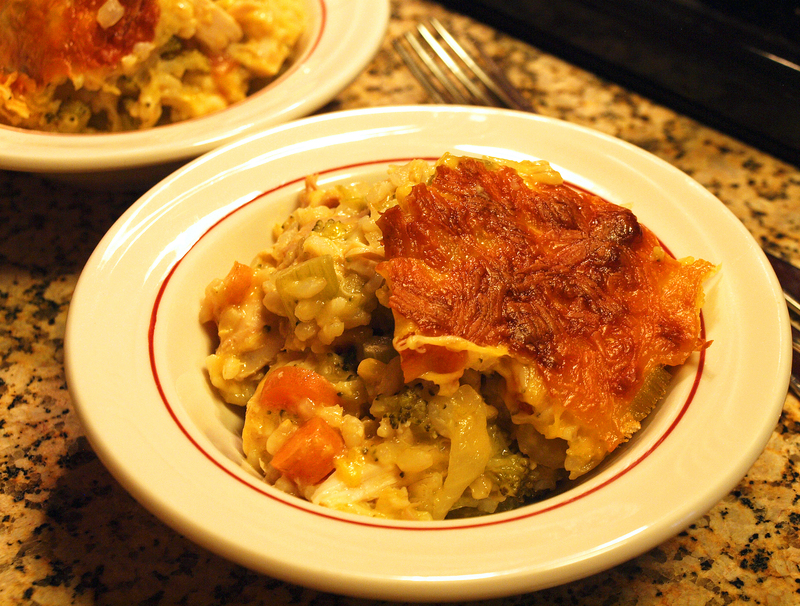 Heck yes, a recipe for Chicken Rice Casserole with no cream of anything soup. 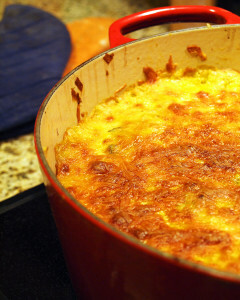 January is a time for comfort foods, and just about anything covered in cheese fits the bill. Surprise though, it’s actually kind of healthy with th e addition of brown rice and broccoli. My recent hiatus was due to some unexpected health issues and I’m very happy to finally be getting my groove back. Kitchen groove! Happy dance! Check out this cheese! Hey, I said *kind of* healthy. I’m enjoying the use of my new dutch oven pot, but if you don’t have one, you can just use a regular large pot to mix up the ingredients and transfer it all to a 9×13 baking dish to do the baking part. To save time, I use use those precooked whole chickens (unseasoned whenever possible) from the grocery store. I take all the meat off and cut it into bite size pieces, then the rest goes into the freezer for my next batch of stock. You could also roast your own or cook up some boneless skinless chicken breasts, or use leftovers or turkey, whatever. Casseroles are very flexible. To prove this point, I started with a recipe then basically changed everything in it and it still turned out delicious. Heat oil in a medium or large dutch oven (I use 5.5 qt in the photo) or pot over medium heat. Saute onion, celery and carrots until softened, about 10 minutes. Stir in garlic and cook for 1 minute. Stir in chicken and rice. Reduce heat to low. Prepare cheese sauce: melt butter into a medium saucepan over medium high heat. Whisk in flour, salt and pepper then slowly pour in chicken broth whisking continuously. Whisk until thick and nearly boiling then stir in cheese until melted. Pour cheese sauce into rice mixture. Top with the last 2 cups of cheese and bake for 25-30 minutes or until cheese is melted through. Broil on high for 5-7 minutes or until cheese is browned on top. This entry was posted in Dinners and tagged chicken, dutch oven, winter. ← New Location: Fort Wayne, Indiana!